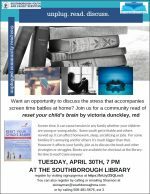 Parents are encouraged to check out the book and read it in time for a group discussion at the Library. That will take place 7:00 pm on Tuesday, April 30th. Books are available for checkout at the Library. Screen time. It can cause tension in any family whether your children are young or young adults. Some youth get irritable and others revved up. It can affect homework, sleep, socializing or jobs. For some families it’s annoying and for others it’s much bigger than that. However it affects your family, join us to discuss the book and other strategies or struggles. 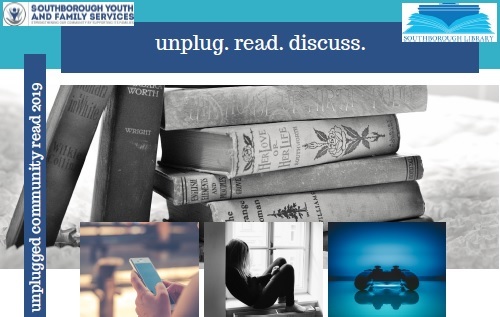 I have to say, that I appreciate SYFS’ ongoing attempts at a community approach to the “Unplugged Initiative”. It’s a whole lot easier to cut back on your kids’ screen time when they know that some of their friends have the same/similar restrictions. The book discussion doesn’t currently have an attendance limit, but they are asking for pre-registration to help them plan. You can sign up here. 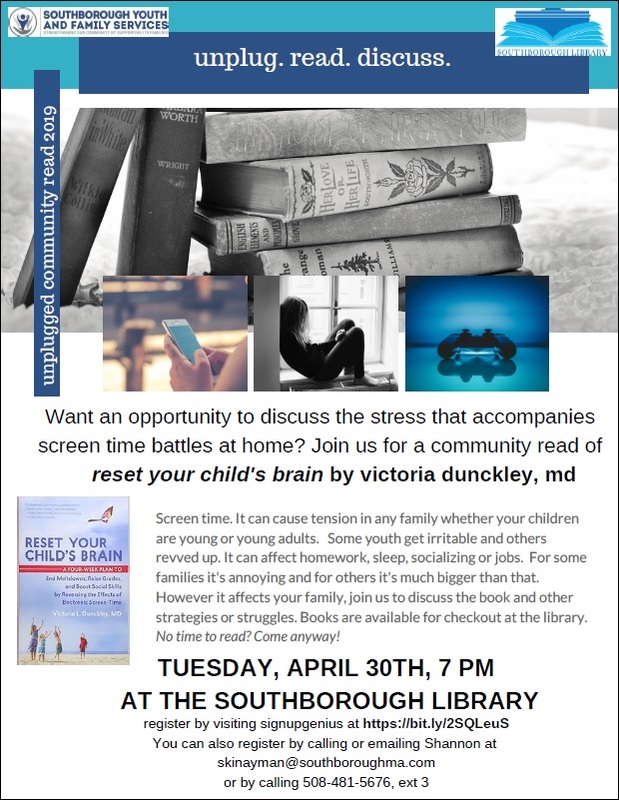 You can also register by calling or emailing Shannon at skinayman@southboroughma.com or by calling 508-481-5676, ext 3.